In a microwave safe bowl, heat pistachio and walnut after pealing the skin, for one minute and keep aside. In a large mixer jar, powder sugar. Then add 3 eggs together and blend. Then add flour and melted Vanaspathi /oil. Add pista essence / pista milk shake and blend well. Then transfer this to another bowl and add baking powder and mix well. Keep this batter for 30 minutes. Mix pistachios and walnuts in 1 table spoon of flour until its well coated. Grease an oval shaped cake tin and dust with flour. Mix the pistachios n walnuts in the batter and just give a stir. Pour the batter to the tin and bake for 30 minutes in 180 degrees. Later, remove this to a wire rack and let it cool completely. Beat the whip cream until the volume doubles. Keep refrigerated until the cake is cool. Run a knife on the sides of the cake tin and invert the cake into another plate. Using a pallatte knife, apply a crumb coat of whip cream evenly on the surface of the cake. Keep in fridge for 15 minutes. 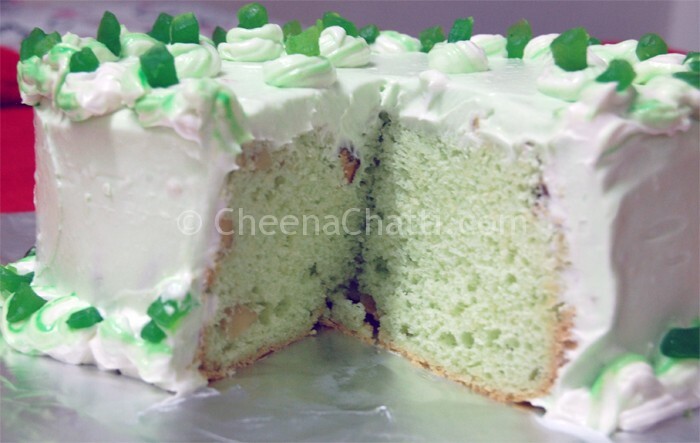 Later add pista milk shake/green color in the cream and apply on the cake to cover it fully and give a nice coating. This entry was added on October 18th, 2013 by Athira Sooraj in Bakery and tagged with cake recipes, cakes, walnut cake, pistachio nut bundt cake, pistachio cake, pistachio walnut cake, indian cake recipes. Last revised on April 4th, 2018.